Alien Of Extraordinary Ability explores issues relating to migration, cultural identity, and border politics. 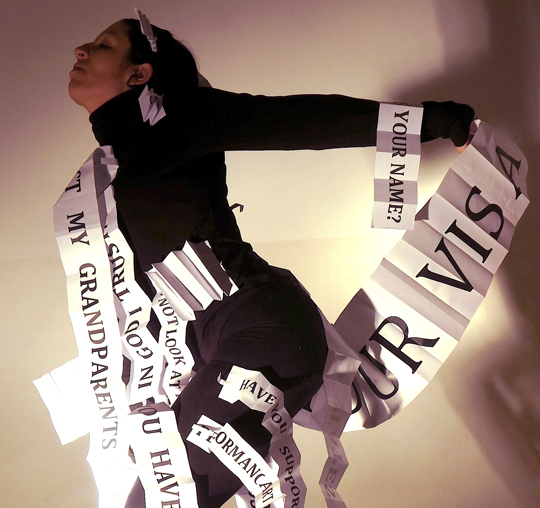 Inspired by the process of applying for a visa to the United States, and using American stereotypes of the Spanish culture, Verónica Peña creates a performance that brings the audience into an interview with an embassy immigration officer. Using Spanish music and traditions, the artist creates a performance where the audience is, as a group and as individuals, engaged in a series of questions that immigrants are asked in order to be granted permission to enter the United States. The performance is based on Peña’s personal experiences, and the questions are real; obtained from the official application forms. Through a combination of pronounced movements, official questions, personal answers, Spanish music, dance, and humor, the artist transports the audience members into the absurd, coherent, subjective, objective, and sometimes-scary episode of applying for permission to live in a foreign country. The title of the performance, “Alien Of Extraordinary Ability”, is how immigration officers refer to immigrants that have obtained an O-1 visa; a type of visa based on professional merit also known informally as “artist visa”.